Arcane Torrent, beta patch 13. Arcane Torrent (previously named Meteor Storm) is a Secondary Wizard skill unlocked at Level 12. It fires small pinkish/purple filaments at a targeted location, bombarding any enemies in the vicinity. It can be cast to any specific spot in range, and will not hit enemies between the Wizard and the location; only those in the firing zone are affected. This skill provides a very damaging bombardment of a location, and can hit multiple enemies in the location, including leaping or flying targets. The kill zone may be moved around by moving the cursor while the skill remains active. The damage is very high, but it is also a very fast resource drain, so must be used with precision. The Wizard calls down a shower of arcane energy, bombarding her enemies wherever she chooses. Refer to the Arcane Torrent rune effects article for thorough descriptions of all five rune effects in this skill, including screenshots, videos, strategy tips, and other related information. In earlier versions of the skill, it functioned like a spectral meteor shower, with the projectiles descending from high overhead. 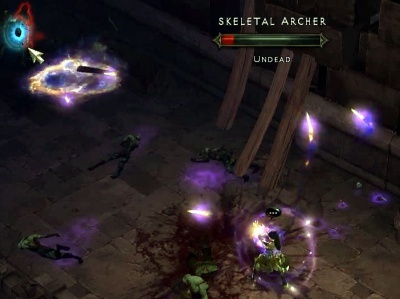 This was changed during development, and when players were first able to use the skill in the Beta patch 13, the animation formed a slight swirl above the Wizard, before flying off at an arching trajectory (much like a thrown object, such as the Witch Doctor's Firebomb skill) to the targeted location. The animation goes along with the function, of a slightly-delayed attack. A half second passes between the first click of the key and the arrival of the projectiles, which requires the player to adjust accordingly. The targeting mechanism makes this very useful for hitting monster beyond the front row, such as mages or summoners or archers in the rear of tanking enemies. The time from cast to hit is fairly short, and the range of striking is at least 6 or 8 yards in radius, so it is possible to use Arcane Torrent against small, quick-moving enemies. Arcane Torrent is less viable for melee fighting monsters, as it does not slow their advance and isn't an ideal choice for point blank combat. The fact that the projectiles hit where the Wizard targets makes it easy to move with or "lead" monsters along, bathing them in the very high damage attack for as long as they can survive it. A video of Arcane Torrent can be seen below, courtesy of the DiabloInc You Tube channel. Arcane Torrent was first shown at BlizzCon 2008 when the Wizard debuted, at that point named Meteor Storm and located in the Storm Skill Tree. It was part of the Wizard presentation video, and besides having its new name and being in the Arcane Skill Tree, was completely unchanged in the BlizzCon 2009 demo. While Arcane Torrent was in the BlizzCon 2010 demo, it was too high-level for players to select it. Skill tiers were removed for the July 2011 Press Event, allowing skills to unlock steadily from levels 1 to 30. Consequently, all skill levels were adjusted and Arcane Torrent became a level 23 skill. The skill description doesn’t really tell you how effective this skill is. It just tells you how much damage it does, and it reads nice, but its not all rainbows and unicorns. The Torrent throws Arcane bolts up in the air and then they fly towards the targeted enemy. In short, its not fast, but if your target isn’t running you will hit them. With the Patch 13 changes, it was classified as a Secondary skill and dropped down to level 12, giving players their first opportunity to try it out. For March's Beta Patch 14, its damage was reduced slightly, except one rune effect - Death Blossom - which had its damage almost doubled. Meteor Storm was the original name of this skill. The name was likely changed when the Meteor skill was added. The skill looked like a meteor shower of polychromatic filaments, and rained down considerable projectiles on a single location. The current version is much changed in form and function. See the Wizard skill archive for more details on previous versions of Arcane Orb (or Meteor Storm) and other Wizard skills. This page was last edited on 16 April 2015, at 17:26.